"My grandmother would use food coloring to make red and green pears only at Christmastime, and I enjoy carrying on her tradition. When I prepare this for a salad, I fill the centers with fresh fruit, fruit cocktail or cottage cheese. As a dessert, there are more options...a dab of whipping cream with a cherry on top, a drizzle of chocolate on top of the whipped cream or a scoop of sherbet in a contrasting color. -Mary Selner, Green Bay, Wisconsin"
In a skillet, bring the sugar and water to a boil. 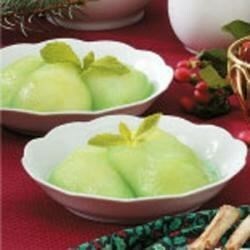 Reduce heat; add food coloring and mint extract. Carefully place pears in syrup. Simmer, uncovered, for 5 minutes or until tender. Place pears in a deep bowl; pour syrup over pears. Make sure pears are completely covered in the syrup to prevent browning. Refrigerate for at least 1 hour or until serving. Garnish with fresh mint. These just didn't taste right to me and they were mushy. Don't overtook them!! Be sure to add plenty of mint, and don't cook them too much. Their delicious! !